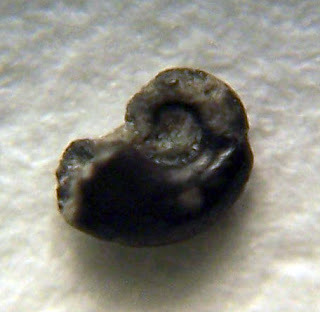 These microfossils were found in the Lexington Limestone of Franklin County, Kentucky. They existed in the Ordovician Period. This first fossil is a snail or gastropod. It appears to be composed of some sort of black material. 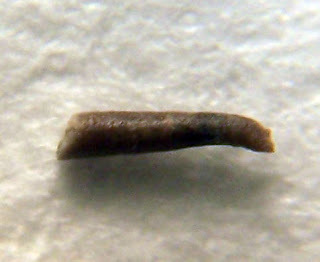 All fossils are about 1 mm in length. A microscope was used to magnify 40x. I tried something new to help produce an in focused image of these 3-D fossils when using a microscope. The idea was to take a series of images with the microscope of one part of the fossil in focus. After taking a series of 4-6 images, put them in a program like Registax to stack the in focus parts together. Well, the plan hit some snags due to my process. First, I was using a handheld camera so the fossil was in slightly different place in each file. The fossil was too big for target box to follow in Registax. The program was designed to be used with astronomy images taken with the telescope so a 16x16 or 64x64 pixel area can be tracked when it is planet or crater size in the image. Needless to say the stacked image was some what blurry. I then tried using Photoshop to align and stack the images. The program was geared to work with larger images. The microfossils images were cropped to about 700x700 pixels and were aligned. I then realized that even though the microscope had been set to focus on a different area of the 3-D fossil the camera I was using seemed to being focusing on the same area of the fossil each time. So all my images pretty much look the same thus rendering the stacking ineffective! I will try this experiment again at a later date and with a fixed mounted microscope camera. This fossil might be a crinoid stem fragment. Thanks to an identification by blog visitor Solius. This is a "Hyolithos; an enigmatic creature that some propose are mollusks."